​and GO impact their community. 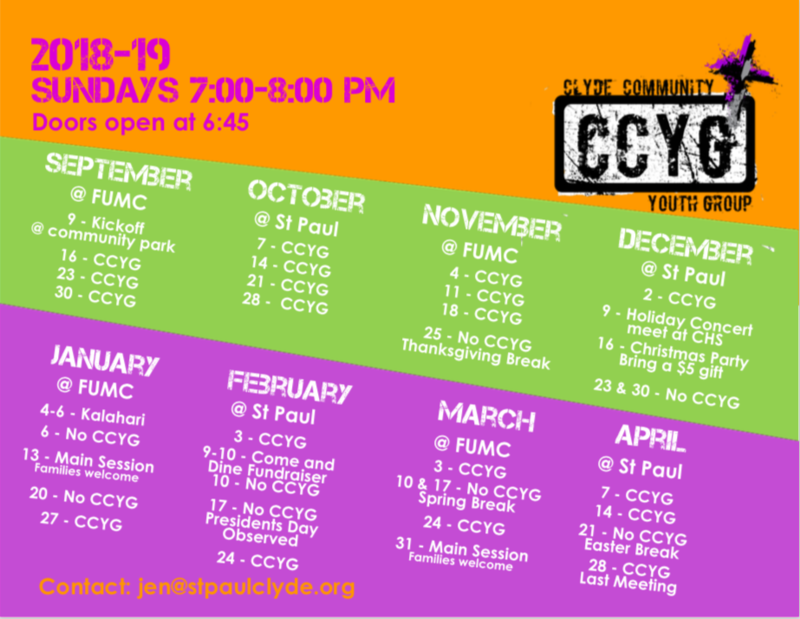 The Clyde Community Youth Group is a group in Clyde, Ohio dedicated to bringing students from different churches together to grow in their faith and impact the community. Each month we host a variety of events for our students, rotating between larger events and small group sessions. Our meeting location rotates between our two host churches in Clyde, St. Paul Lutheran Church and First United Methodist Church. Meetings take place on Sunday evenings from 7:00 pm to 8:00 pm, with doors opening at 6:45 pm. To learn more about upcoming and past events, please click on the events tab for your grade level.